He, like most men in their 30’s, is a little obsessed with his x-box. So to take a different slant on this theme, I went with his favourite games and characters rather than just doing a giant x-box cake. One game he plays regularly – he even reads the books – is Assassin’s Creed. 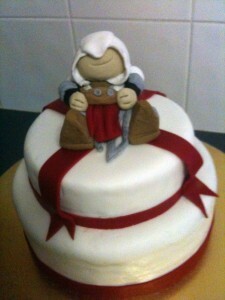 Basically, it is about the Knights Templar and quite obviously being a trained assassin. I had so many ideas for rolling hills and stone walls but ended up keeping it very simple with the red and white theme of the Templar, more specifically their cross. I even made red and white cakes. The top tier was a Red Velvet cake and the bottom tier a Vanilla Fudge cake. So even when the cake was cut, the theme carried through. After having attempted Dorothy the Dinosaur in a previous cake (the night before the party! ), I looked at doing another figure. 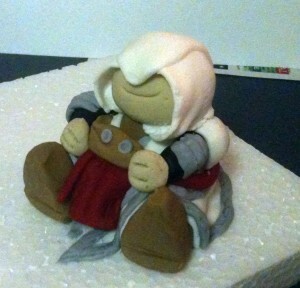 I made a fondant Ezio figure to sit atop the cake. This time; however, I used Tylose as my modelling agent and added small amounts of copha to stop dry cracks appearing. This worked so much better than Dorothy and the Gum Trag, and I even managed to complete him in just over 90mins. 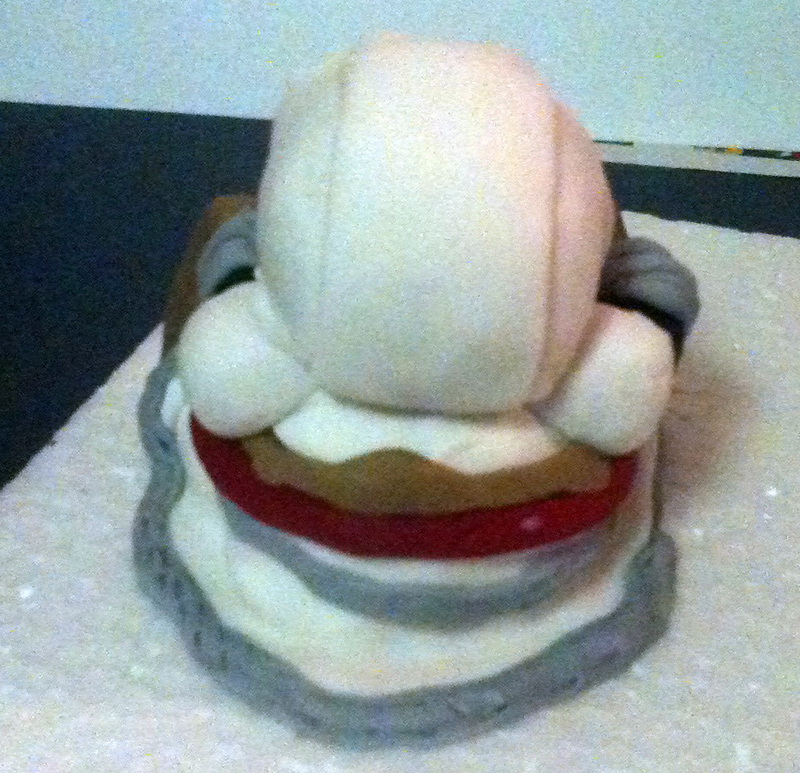 I did him a whole week before the cake and he was solid and ready to go – with much less fuss. 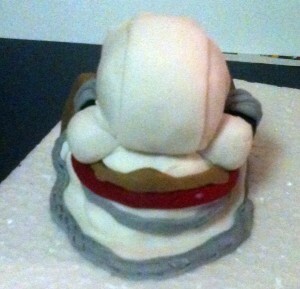 I found that using the right copha and tylose mix, the fondant was more pliable and surprisingly not sticky. I use lots of objects from around the house like tweezers, straws and bottle lids when I’m creating figures and other toppers. Fingers can be too big to do little details so a pair of tweezers, nail scissors and fine paint brushes always help to get things into place.